This season has many meanings…depending on your faith, your family traditions, your heritage. For me, December is a time to reflect on endings and anticipate new beginnings as the calendar rolls over to 2010. I extend my appreciation to our faculty, staff and students, alumni, donors, and friends who, throughout the year, have all contributed to our individual achievements, and our overall success. We have an amazing (and expanding!) team of bright, energetic, optimistic people who make up the College of Health and Human Sciences. We’ve had a phenomenally successful year…there’s a lot to celebrate! We had a record 26% increase in undergraduate enrollment with 625 new students (our largest class ever!) for a total of 2993 undergrads and 229 graduate students. Our HHS Welcome Picnic was great fun! Three generations of the Ford Family joined us as we launched the new Hallie Ford Center for Healthy Children and Families followed by our symposium highlighting the Center’s researchers on 09/09/09. Generous donors provided $342,000 in scholarships and fellowships for 200 students who received their awards at our annual Celebration of Excellence. Grants and contracts brought in more than $16 million this past fiscal year. 27 undergraduate students conducted research alongside faculty throughout every department of our college. Hundreds of students completed internships, study tours, and study abroad programs – here in Oregon and around the world. 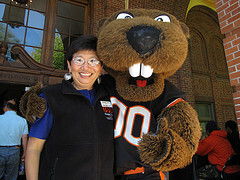 Our alumni are coming home – a record turnout at our annual Homecoming Run and other events including Golden Jubilee, the OSU Gerontology Conference, our graduation tea for grads and families, the DHE career symposium, and the Oregon Public Health Association conference. Our Health and Human Sciences Family welcomed the 4-H Youth Development Program into our college…a natural fit for this popular and proven program to support the health of our youth. Everyone stepped up to the plate and worked creatively and collaboratively as we forged our new Division of Health Sciences and welcomed the College of Veterinary Medicine and the College of Pharmacy to our expanding family. I am honored to be the Executive Dean of this Division. With all the good fortune we have had this year, I just know that this is a springboard for a great 2010! So, as we say in my culture Gong Hei Fard Choy…all the best in the new year for health, happiness, harmony, and fulfillment!